Here’s another instalment in my ongoing examination of Murray’s recorded output. This is another very early recording from Murray, this time with a full quartet. It’s one of a number released on European labels, and recorded in France or Italy during 1978. Five LPs were produced out of two concerts: one on the 30th January at Rouen University, and one over two nights on 6th and 7th February at the Theatre Mouffetard, Paris. 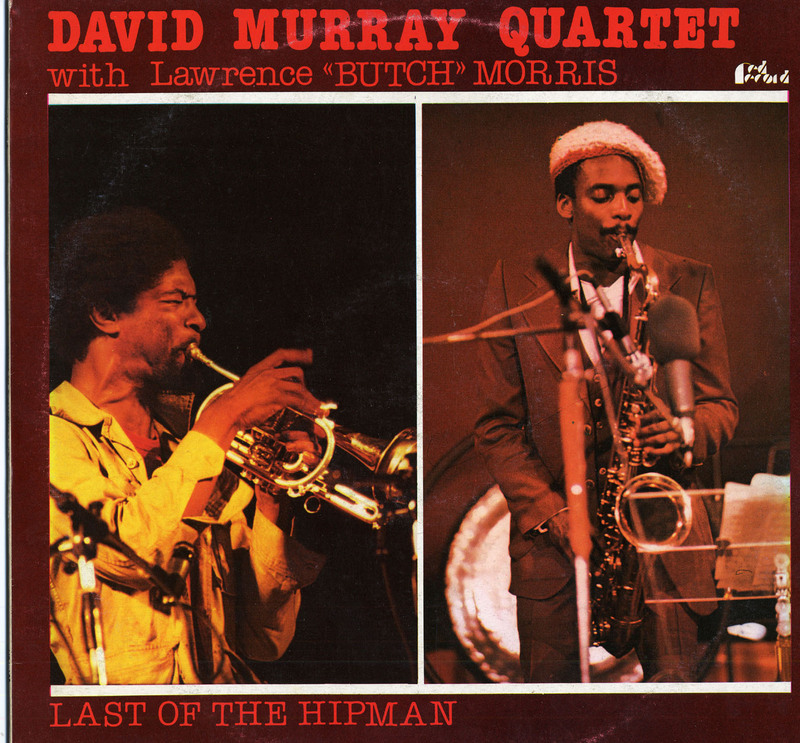 There’s some evidence that Murray’s manager at the time, Kunle Mwanga, arranged for the recordings, and then sold tapes to different independent jazz labels. The 30th January date resulted in Let The Music Take You (released on [and still available from] Marge Records in France) and this record, released on Red Record based in Milan and currently not available commercially. The February solo performances were released on three vinyl LPs on different labels. The record gets its title from one of the tracks, although the track’s called ‘Last of the Hipmen’, the album sold as Last of the Hipman. As the album title doesn’t seem to make much sense (it certainly wasn’t the last that we heard of Murray), and only appears on the album sleeve, I’ve always wondered if it was a typo. They mis-spelt Dyani anyway. During this time there was no real stability to Murray’s bands. Butch Morris was clearly in Europe with Murray at this time because he appears on the February Milan Studio recording that was released by Black Saint as Interboogieology and an August live recording in London (released as The London Concert). Expatriate South African Johnny Dyani was heavily involved in the London new jazz scene at the time, and he appears on this date, The London Conference and the recording for 3D Family on September 3, 1978 live in concert at Willisau Jazz Festival (available on hatArt). Dyani seems to have made a big impression on Murray, and he dedicated recordings to him over the years using Dyani’s African name of M’Bizo. I know nothing about George Brown, and it seems unlikely from his playing here that he was the same G Brown who played Bop drums in the 1960s in the US. As I noted in an earlier post ‘Monk’s Notice’ is a James Newton composition also recorded for Solomon’s Sons almost exactly a year before, and the two Murray compositions were often featured in other recordings (‘Hipmen’ in 1981 and 1987; ‘Patricia’ in 1977, and 1986). The record company is also worthy of some note. Red Record was (and still is) run by Sergio Veschi in Milan, and started recording and / or releasing free jazz as part of the Italian left cultural movement. It’s likely that the red in question was therfore the symbol of left-wing politics in Europe. Better known today for musicians like Bobby Watson, the label is a key institution of Italian and European jazz, and supporter of the American avant-garde (more details at http://www.ijm.it/wp/whos-who/sergio-veschi). I rate this as one of Murray’s most interesting records of the 1970s. damn ,i for one want one!! thanks for the extensive coverage and analyses, is it really only 152 albums murray has made!! ah yes ,i thought i was posting the above comment under organic saxophone, thats one i certainly need. Thanks for visiting, sotise. 152 as leader or co-leader. Lots more as a sideman! Organic Saxophone is coming to a blog near you very soon.